He was good~One of our best! Edited by onjig, 02 August 2017 - 01:13 PM. 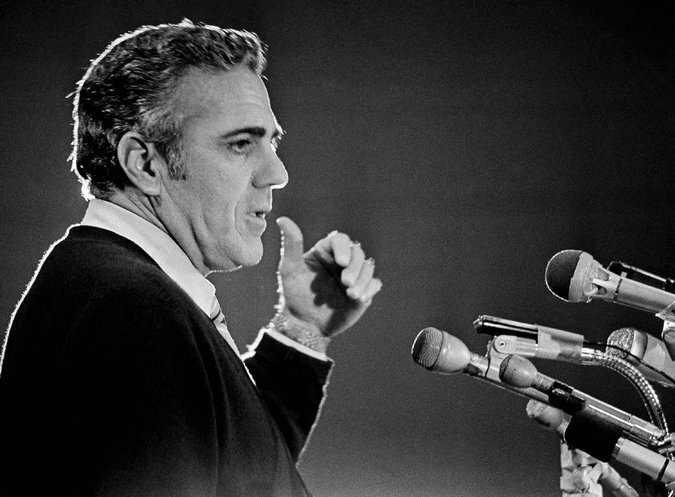 Ara Parseghian, the charismatic Hall of Fame coach who woke up the echoes at Notre Dame, restoring the Fighting Irish to football glory in the 1960s and 1970s with two national championships and an innovative, psychologically astute approach to coaching, died Aug. 2 at his home in Granger, Ind. He was 94. The University of Notre Dame’s president, the Rev. John Jenkins, issued a statement announcing the death. Mr. Parseghian had recently been treated for a hip infection. Mr. Parseghian (pronounced par-SEEG-yun) took over the head coaching job of perhaps the country’s most storied college football team in 1964, after rebuilding the fortunes of perennial Big Ten doormat Northwestern University. Notre Dame had been a gridiron powerhouse since the turn of the 20th century, building a nationwide following under coaches Knute Rockne, Elmer Layden and Frank Leahy. Since Leahy’s retirement in 1953, the Irish had descended into mediocrity, with an abysmal 2-7 record in 1963. The intense, handsome Mr. Parseghian immediately brought a new sense of order, rebuilding the team’s reputation at the same time Notre Dame’s president, the Rev. Theodore M. Hesburgh, was transforming the Catholic university in South Bend, Ind., into a preeminent academic institution. From the beginning, Mr. Parseghian was seen as someone with a new approach to coaching. He wasn’t so much a stern general of the sideline as a sensitive manager of human potential acted out through blocking and tackling. Mr. Parseghian had the team’s helmets painted the same shade of gold as the dome of the Main Building, a 19th-century campus landmark. He led his players in calisthenics during tightly organized practice sessions that never lasted longer than two hours. He applied lessons from psychology to help motivate his team. With an uncanny knack for putting players in the right positions, Mr. Parseghian converted a fullback to tackle, shifted an oversized halfback to defensive end and moved another halfback, Jack Snow, to split end, where he became an all-American. He installed a quick-strike offense built around the passing of senior quarterback John Huarte, who had seen little action in previous years. Week after week, Mr. Parseghian’s team rolled on and, in the words of the Notre Dame fight song, began to “wake up the echoes” of past gridiron glory. After a 40-0 victory over Navy and its reigning Heisman Trophy winner Roger Staubach, the Irish were ranked No. 1. By season’s end, Huarte, the once-overlooked backup quarterback, had won the Heisman Trophy as college football’s best player, and Mr. Parseghian was featured on the cover of Time magazine. Notre Dame was on the verge of a perfect season until the last two minutes of the final game, as the University of Southern California scored a 20-17 upset to drop the Irish to No. 3 in the Associated Press poll. Mr. Parseghian’s team had a 7-2-1 record in 1965 and then sailed through the next season undefeated before meeting Michigan State on Nov. 19, 1966. Notre Dame was ranked No. 1 in the country, Michigan State No. 2. Billed as the “game of the century,” the battle of unbeaten teams was shown on national television and drew more than 80,000 fans and 750 members of the media to Spartan Stadium in East Lansing, Mich.
With several of Notre Dame’s top players out of action because of injury, Michigan State built an early 10-0 lead. Notre Dame fought back with a touchdown and a fourth-quarter field goal to tie the game. As the clock wound down, Notre Dame had possession deep in its own territory and controlled the ball with a series of running plays until time expired. The final score was 10-10. The game remains one of the most memorable in football history, yet Mr. Parseghian was criticized for settling for a tie and not making a last-ditch effort to win. A week after the Michigan State game, the Irish trounced Southern Cal, 51-0, in Los Angeles to secure the country’s No. 1 ranking and Mr. Parseghian’s first national title. During the 1970 season, behind quarterback Joe Theismann, Notre Dame finished second in the country after upsetting top-ranked Texas in the Cotton Bowl on Jan. 1. 1971. Mr. Parseghian led his team to a perfect season in 1973, but that year six other teams also finished without a loss. The Irish met the top-ranked Alabama Crimson Tide, coached by Paul “Bear” Bryant, in a Sugar Bowl showdown. Throughout the dramatic game, the lead changed hands six times. Late in the fourth quarter, with the Irish on their 2-yard line, Mr. Parseghian called a daring pass play that led to a crucial first down and preserved a 24-23 Notre Dame victory — giving Mr. Parseghian his second national championship. The next year, Notre Dame finished its season with a 9-2 record and was scheduled to meet Alabama again, this time in the Orange Bowl on New Year’s Day. Two weeks beforehand, Mr. Parseghian announced that the stress of coaching was damaging his health and that the Orange Bowl would be his final game. Ara Raoul Parseghian was born May 21, 1923, in Akron, Ohio. His father, who was born in Armenia, worked in a rubber factory. His French-born mother made young Ara wear a beret to school, which contributed to a toughness that led him to become a schoolyard fighter and athlete. After Navy service during World War II, he became a star halfback at Ohio’s Miami University, where his coach was Hall of Famer Sid Gillman. Mr. Parseghian played briefly with the Cleveland Browns until a hip injury ended his career. He returned to Miami University, graduating in 1949 and receiving a master’s degree in education in 1951, the same year he took over as head football coach from future Hall of Famer Woody Hayes. Five years later, after compiling a record of 39-6-1 at Miami, Mr. Parseghian moved to Northwestern in Evanston, Ill., turning around a program that was winless the year before he arrived. When he was at Notre Dame and for years afterward, Mr. Parseghian repeatedly rejected lucrative NFL coaching offers, including from the Washington Redskins. He worked as a college football analyst on television until 1988. With a lifetime coaching record of 170-58-6, including 95-17-4 at Notre Dame, he was inducted into the College Football Hall of Fame in 1980. Survivors include his wife of 69 years, the former Kathleen “Katie” Davis, of South Bend; two children, Kris Humbert and Mike Parseghian; and a grandson. A daughter, Karan Parseghian, died of complications from multiple sclerosis in 2013. Three of his grandchildren died of a genetic disorder, Niemann-Pick Disease Type C, leading Mr. Parseghian and his wife to start a medical foundation to help find a cure for the disease. One thing that endeared Mr. Parseghian to the Notre Dame faithful was that members of the student body were free to try out for the football team. Few were chosen, but one exception was a 5-foot-7, 26-year-old Navy veteran named Dan Ruettiger. In retirement, Mr. Parseghian continued to live near South Bend and often acted as an informal adviser to later Notre Dame ­coaches. The Rev. John Jenkins, president of the University of Notre Dame, announced the death in a statement. Parseghian, whose home was not far from the university’s campus in South Bend, Ind., had recently been undergoing treatment at a care facility for a hip infection. 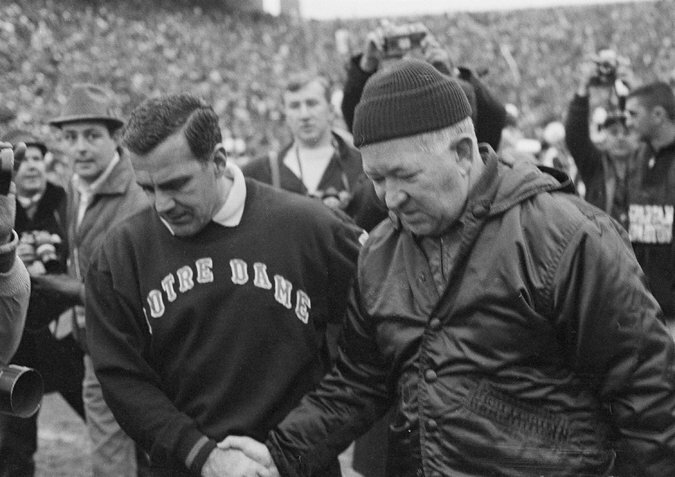 Parseghian ranks with Knute Rockne and Frank Leahy in the pantheon of Notre Dame football coaches. In his 11 seasons (1964 through 1974), his teams won 95 games, lost 17 and tied four, for a .836 winning percentage. His 1966 and 1973 teams were voted national champions. When Parseghian arrived at Notre Dame, the university’s football program had been in decline for years. The collapse started in 1956, when Notre Dame won only two games and lost eight. Though there were some victories, Notre Dame never won more than five games in a season from 1959 to 1963. Twice it won only two games. Notre Dame fans and Notre Dame haters — there have always been armies of each — offered theories: The university’s leaders were de-emphasizing football as they sought to raise the school’s academic reputation; good players didn’t want to go to an all-male school; tradition alone could not attract enough talented athletes; the coaching was bad; all of the above. Meanwhile, Parseghian was gaining a reputation. After five highly successful seasons at his alma mater, Miami of Ohio, where he was a protégé of Woody Hayes, he moved to Northwestern for the 1956 season. He barely broke even in his eight years there, but he was credited with doing a lot at an academically rigorous institution with no trace of a football factory image. 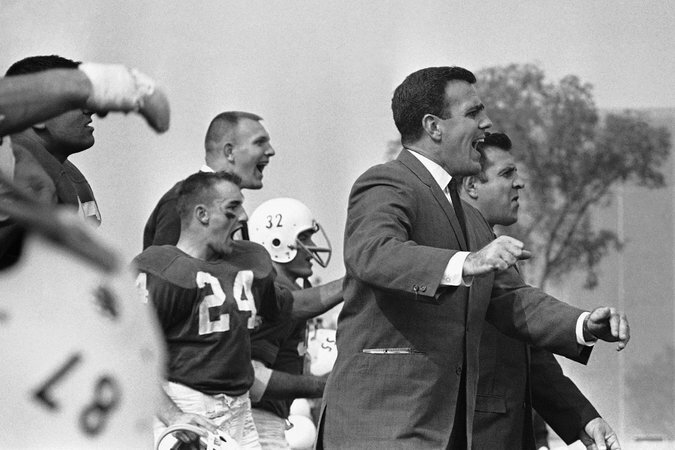 By the early 1960s, Notre Dame’s administrators were all too familiar with Parseghian; his Northwestern teams had beaten Notre Dame four years in a row. At the time, Notre Dame had an interim coach, Hugh Devore, and Parseghian’s relationship with the Northwestern athletic director, Stu Holcomb, had become strained. Parseghian contacted the Rev. Edmund P. Joyce, Notre Dame’s vice president and its chairman of athletics, and soon it was announced that he was headed to Notre Dame. In the spring of 1964, student servers in Notre Dame’s main dining hall noticed that football players were forsaking gravy and ice cream. The new coach had told them that they were going to be leaner and faster. Above all, Parseghian wanted to change the players’ emotions. “The biggest problem was to re-instill the confidence,” he recalled in a television interview years later. This he did, with an enthusiastic, hands-on approach in practices that were always well organized. Parseghian had a keen eye for talent that had been misused or overlooked. Besides shifting the sure-handed Snow to receiver in 1964, he converted three big but rather slow running backs (“the elephant backfield,” he later called them) into linemen, where they thrived. Most important, Parseghian decided his starting quarterback would be the senior John Huarte, who had spent far more time on the bench than on the field his sophomore and junior years. Snow was Huarte’s favorite receiver as the Fighting Irish won nine straight games in 1964, with many of the same players from the squad that had lost seven games the year before. Southern California spoiled a perfect season with a 20-17 victory in Los Angeles, but Huarte, who had not even won a varsity letter until 1964, was awarded the Heisman Trophy. 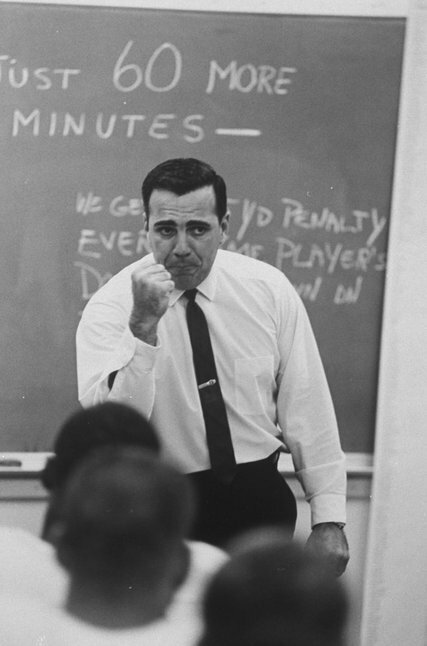 Parseghian was acclaimed coach of the year. In his 11 seasons at Notre Dame, Parseghian demanded the best from his players without cursing or breaking clipboards on the sideline. “All he had to do was look at you,” Ross Browner, an all-American defensive lineman in the 1970s, recalled years later. But for all his success, Parseghian was saddled for a time with the reputation of a coach who “couldn’t win the big ones.” That image was reinforced on Nov. 19, 1966, when unbeaten Notre Dame met unbeaten Michigan State at East Lansing in the most eagerly awaited college game in 20 years. Notre Dame fell behind, 10-0, then rallied to tie the score. But late in the game and in its own end of the field, Notre Dame played conservatively rather than risk a turnover, and the game ended in a 10-10 tie. Although Notre Dame was voted the national champion by the wire services, there were many who thought the game had taken some luster from the team’s image. After the 1969 season, Notre Dame accepted an invitation to meet top-ranked Texas in the Cotton Bowl, ending four decades in which the Irish did not take part in postseason play. Texas won, 21-17, on New Year’s Day 1970. A year later, after another season-spoiling loss to Southern California, Notre Dame returned to the Cotton Bowl and upset Texas, 24-11, to snap the Longhorns’ winning streak at 30 games. Notre Dame’s next bowl appearance was a crushing 40-6 loss to Nebraska in the Orange Bowl after the 1972 season. The 1974 season was Parseghian’s last, and in some ways his toughest, even though his team finished 10-2. Several players had been suspended for disciplinary reasons before the season. And in the regular-season finale, Notre Dame suffered a crushing 55-24 loss to Southern California after leading by 24-0. Parseghian announced in December 1974 that he was retiring, saying that a quarter-century in coaching had left him “physically exhausted and emotionally drained.” Another New Year’s victory over Alabama, this time in the Orange Bowl, enabled him to go out a winner. He last appeared as a coach on July 24, 1976, was in the College All-Star Game against the defending Super Bowl champions, the Pittsburgh Steelers. The contest, at Soldier Field in Chicago, made history: It was the first game halted by a rainstorm in National Football League history. Stopped in the third quarter, the game never resumed. It turned out to be the final All-Star Game; the match was discontinued after 42 years. Ara Raoul Parseghian was born in Akron, Ohio, on May 21, 1923, to Michael Parseghian, who had fled Turkey amid the Armenian genocide, and Amelia Bonneau. His mother had forbidden him to try out for his high school team, and when he did, and made the team, he kept it a secret from her — until the day he came home with an injury. Parseghian joined the Browns after college, but a hip injury ended his professional playing career. He returned to Miami as the freshman coach and became the head coach when Hayes left for Ohio State. After leaving Notre Dame, Parseghian was a color commentator for ABC Sports from 1975 to 1981 and for CBS Sports in 1988. Surviving are his wife, Kathleen, whom he married in 1948; a daughter, Kristan, and a son, Michael. Another daughter, Karan, died in 2012. His brother, Gerard, died in 2010, and his sister, Isabelle Atwood, died in 2008. In 1994, Parseghian founded the Ara Parseghian Medical Research Foundation, dedicated to financing research on Niemann-Pick Type C disease, a genetic pediatric nerve disorder that killed three of his grandchildren. I know we don't live forever but, it hurts in my heart to see them slipping away. Vanetsi, Good you posted this!